Friends and family of Sheldon Gary Farnell gathered together to pay tribute to the ‘beautiful’ youngster. 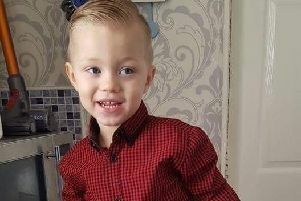 The four-year-old died of suspected sepsis last Monday - 24 hours after he was sent home from Sunderland Royal Hospital. His dedicated mum, Katrina Farnell, has vowed to fight for justice after doctors failed to save her joyful little boy. A review into the circumstances around Sheldon’s care has been launched by bosses at City Hospitals Sunderland NHS Foundation Trust. Last night, Sheldon’s grieving family were joined by dozens of friends and family members in Herrington Country Park to let off balloons and pay tribute to the beautiful boy, who was loved by so many. Katrina, 23, thanked everyone for their support. She said: “It was lovely today. I really appreciate everyone’s support, it touched my heart. Balloons spelling his name were released with some carrying pictures of Sheldon along with balloons printed with characters from Paw Patrol - one of the youngster’s favourite shows. His grandad Gary Farnell, said: “Everyone loved him, he will be sadly missed. Amy McConville, a close friend of Katrina’s who organised the event with Beth Parkes, said: “I can’t believe this many people showed up when the weather is so bad, it’s proof that it’s for a good cause and that Sheldon was loved by everyone. “I wish we weren’t doing this but because we have I hope the family love it. “They’re over the moon, they’re so grateful they can’t believe this many people showed up in the rain. Beth Parkes said: “It’s heartbreaking. I know all the family loved him, he was their first boy. More than £2,000 has now been donated to a Go Fund Me page to give Sheldon the send of he deserves. Friends of the family have organised the Sheldon Gary Farnell Shining Star Fundraiser at Burnmoor Cricket Club, from noon to 5pm on Sunday, the day before Sheldon’s funeral.